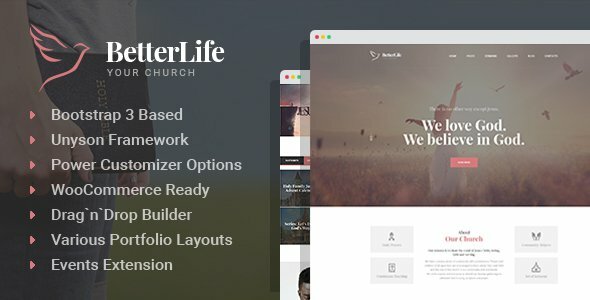 BetterLife – new light and airy WordPress theme, that will be a perfect match for a church website, christian charity organization or other religious establishments. The theme is totally responsive, so it’s going to look stunning on all of modern devices. It comes in light and dark versions, as well as boxed and wide layout variations. It’s improved with Unyson Page Builder, that lets you build your own unique, personal pages. Features fonts from Google Fonts Library and FontAwesome icons. Be sure, this is going to be most successful purchase! And our support team is always going to be near to help!